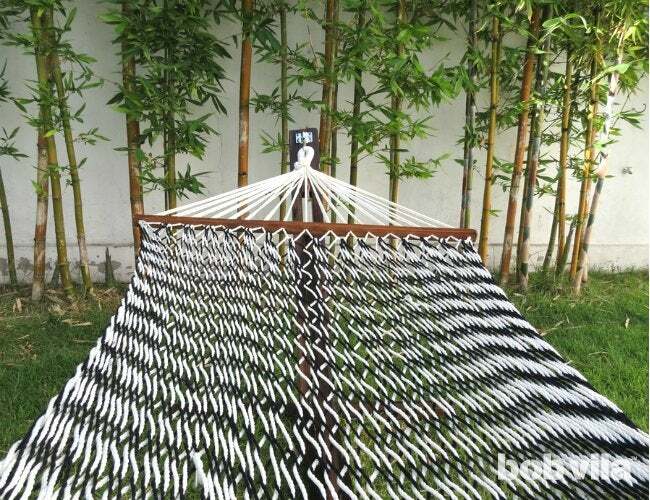 Build this outdoor hammock stand in an afternoon—just in time to take a nice long nap in the sun! 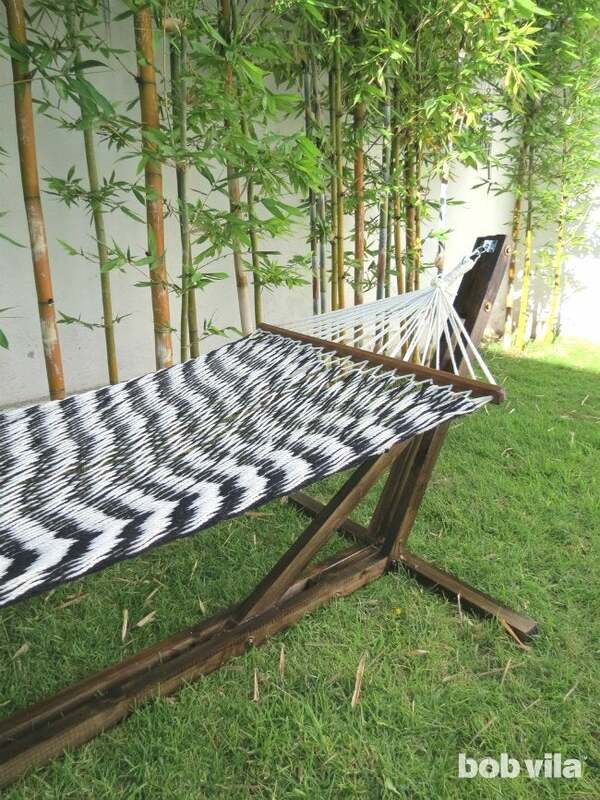 Wish that you had a relaxing moment in a camping hammock in your own backyard, but have nowhere to hang it? 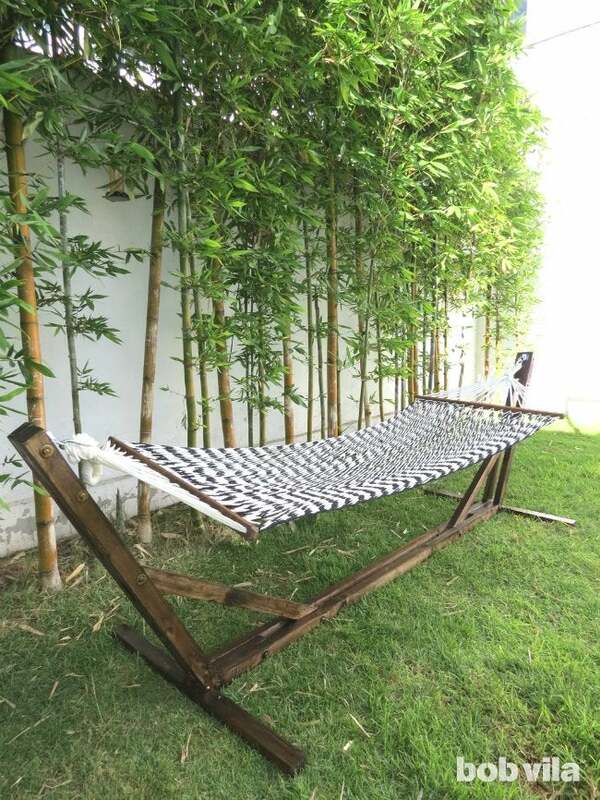 Rather than wait years for two trees to grow large enough to anchor it, solve this problem before the end of summer by building a DIY hammock stand. 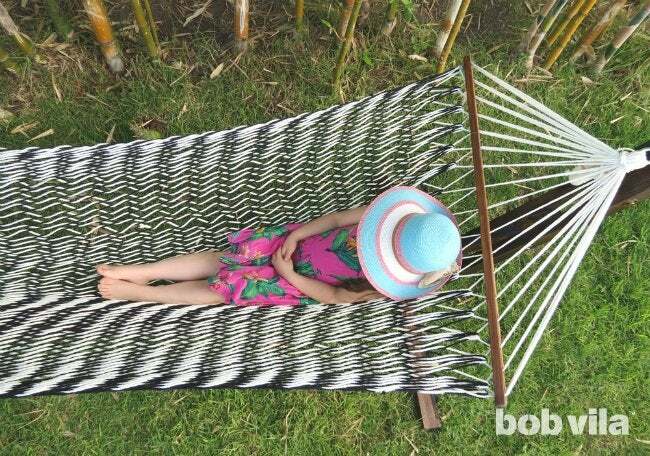 Made from a few planks of lumber, this hammock stand is lightweight enough to pull toward any shady corner—even follow the shade throughout the afternoon—yet sturdy enough so that any grown adult can enjoy nap time once again. The first thing to do is cut all the lumber to the dimensions needed for the project. 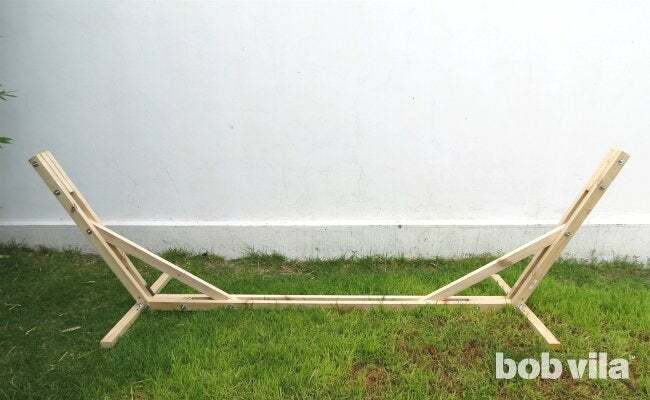 To make what we’ll continue to refer to as the “base” of the DIY hammock stand, you will need two 8-foot-long 2×4s. Lay them so that the 3-½-inch sides (remember, a 2×4 isn’t exactly 2 inches by 4 inches) rest flat on the floor. Then, use a set square to help you make mirroring 30-degree angle cuts at each end of the boards. You’ll pencil lines from the top left and top right corners of each plank at a 30-degree angle in toward the center, then cut. Sand down your lumber, paying particular attention to the sawn ends. Note: You’ll make several cuts at 30- and 60-degree angles during this project. 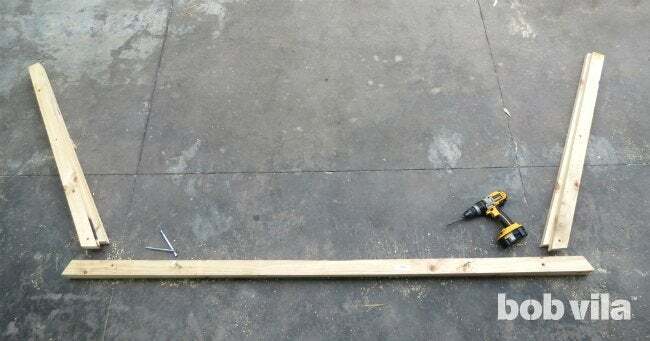 If you don’t own a fancy power saw, you can use a set square and a hand saw instead. Next, cut two 2×4s in half to make four “lateral posts,” each with one flat and one angled end. To make these cuts without any wood scraps, measure and mark the exact center of each length of lumber—at 4 feet in, and then 1-3/4 inches down. Lay your set square over the center dot so that you can draw a line at a 30-degree angle directly through your mark. Draw a line at a 30-degree angle, and cut. Sand down your cut pieces. 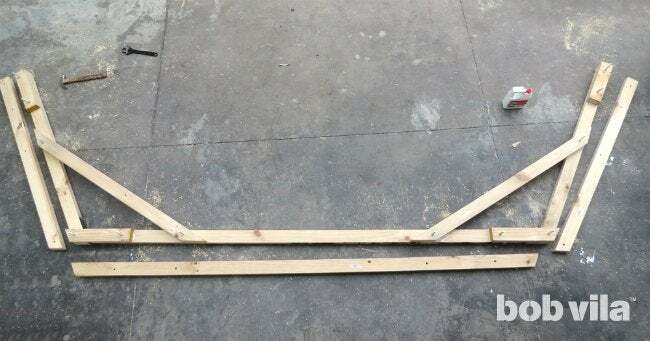 Now, you’ll create “slant timbers” to connect the base and lateral posts for extra support (see the diagram in Step 4). Take one of the couple remaining 2×4s, measure to find its center (again: at 4 feet in, and then 1-3/4 inches down). Draw a line at a 60-degree angle through the center, and cut following the line. You’ll have two pieces of wood of the same length, each with one end at 60-degree angle. Cut the straight end of each piece at a 60-degree angle, too, but one that is a mirror image. Sand down all of the pieces. Cut four 15-inch pieces from another of the remaining 2×4s. Leave two pieces with 90-degree cuts on either end; you’ll use those to join the top part of the lateral posts. The other two should each have one end flat and the other cut at a 30-degree angle (so that the cuts mirror each other); those two will strengthen where the base meets the lateral posts. Sand them completely. • Start with the one base lumber (its longer side should face up) and a lateral post on each side, touching but not overlapping. 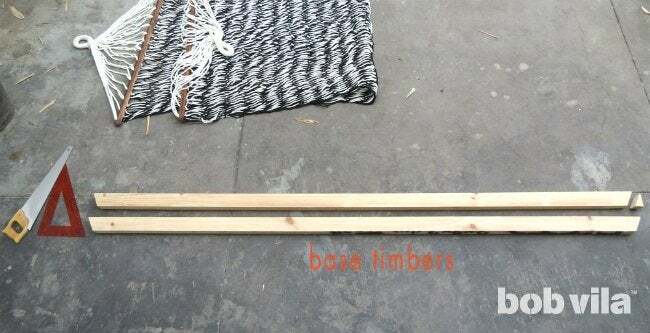 • Then lay a slant timber diagonally to connect the lateral post and base; where the slant timber’s end overlaps the base should be about 20 inches in from the base’s end. • Finally, position the four 15-inch cuts: two (without angles) on top of the lateral posts and two (with angles) overlapping where the base and the lateral post meet. 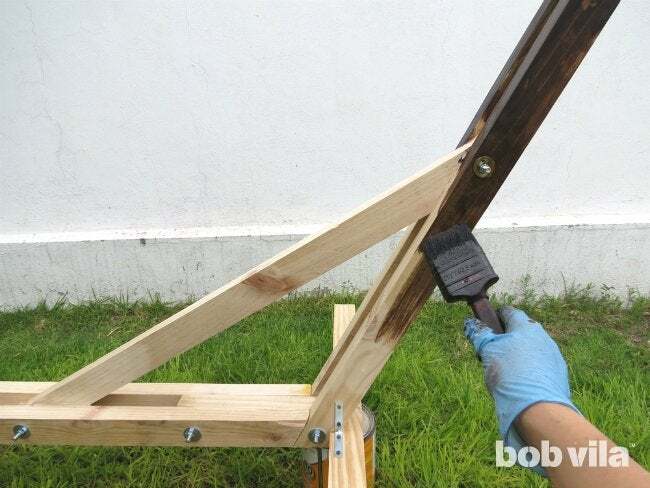 Hold the pieces of the in-progress hammock stand with clamps as you and drill pilot holes through both layers of both wood. You’ll want to drill as straight as possible to easily pass the bolts through afterward. Drill two holes through the top of the stacked 15-inch pieces and lateral posts, one hole through each end of the slant timbers, and two holes through each of the 15-inch cuts joining the base and the lateral post. Repeat on the other side, so that you end up with 12 holes total. Now, lay out your remaining cuts—the second base wood and the two unused lateral posts—as you did in Step 4, just without any 15-inch pieces. 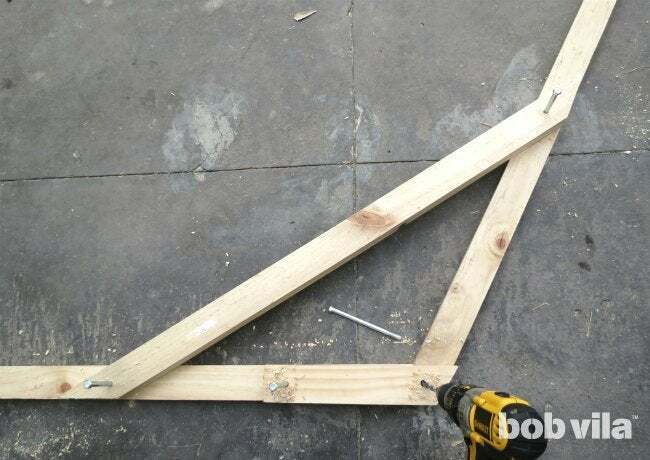 As the drill bit is not long enough to drill through three layers of 2×4s to join both sides of the DIY hammock stand, you need to precisely mark the holes you’ve just completed onto your remaining materials. 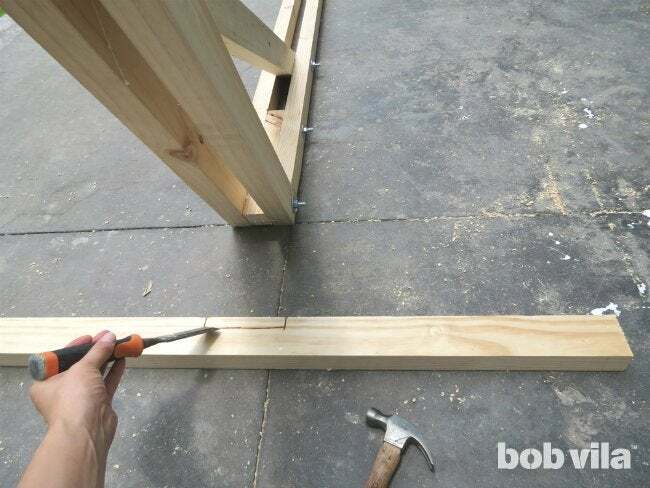 Lay the already bored base and slant timbers over top of them, and use your drill to mark the holes’ locations. Remove the wood you’ve already drilled in Step 5, and complete the holes where you’ve marked. Again, remember to drill as straight as possible. Thread a 6-inch hex bolt with washer through each hole in the first half of the structure that you created in Steps 4 and 5, assembling any overlapping layers as previously explained. Apply a little wood glue between each piece of lumber. Finish by laying the second base and the two lateral post on top. Cap each bolt with a washer and a nut, in that order, then tighten. Wait until the glue dries before flipping the structure vertically. Then, add two feet to steady the DIY hammock stand. You’ll cut your last 2×4 in half to make them. At the center of one of the 4-foot-long pieces, cut a notch into the 3-1⁄2-inch-wide side of the 2×4 that measures 1-inch deep and 4-1⁄2 inches wide (about as wide as your hammock stand measures after assembly) using a wood chisel and hammer. Repeat to make a second foot for the opposite end of your hammock stand, then sand both pieces. On the first foot, line the notch with wood glue, then turn 2×4 so that its 3-1⁄2-inch side remains flat to the ground and slide it up to fit the notch snugly around the bottom of the hammock stand. Drill pilot holes for three 3-1⁄2-inch screws. 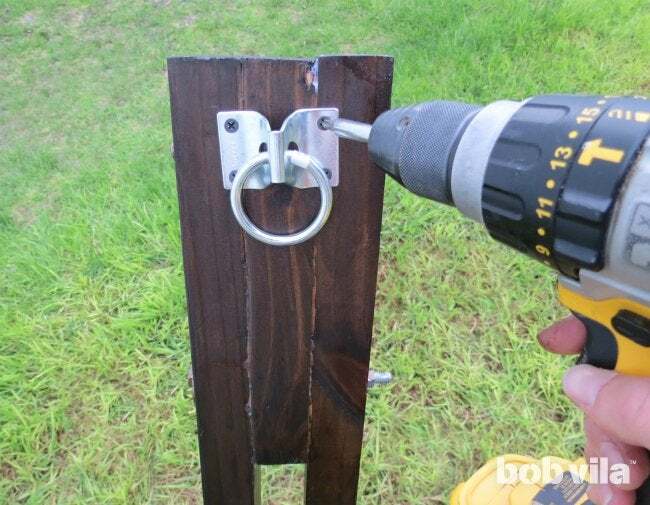 Then, affix metal brackets (using four 2-inch screws apiece) to connect the foot to the lateral post on each side of the stand. Almost done! 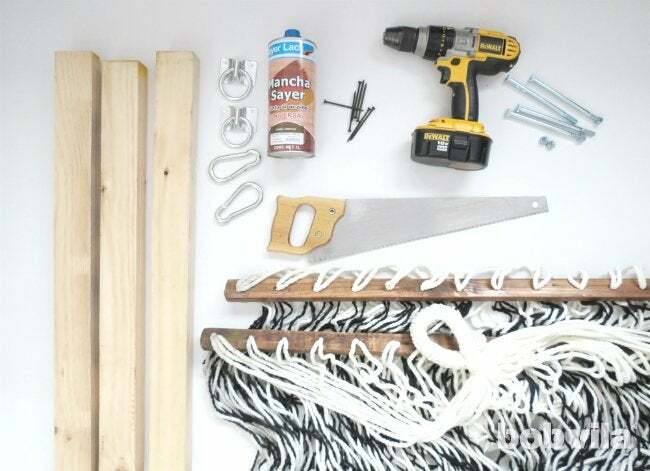 This is what your DIY hammock stand should look like at this point. Apply a coat of exterior wood stain in the color of your choice to protect the wood from the moisture it’ll encounter outdoors, working the stain in the direction of the grain with your brush. If you choose an oil-based stain, use a natural-bristle brush; for latex stains, use a synthetic-bristle brush. Then, leave the wood to dry for the amount of time suggested on the stain’s package (likely 24 hours). If you don’t have a specially formulated exterior wood stain to help weatherproof your backyard project, you can choose any standard wood stain followed by at least two coats of varnish instead. Finally, to hang the hammock, fasten a hitch ring with four 2-inch screws into the top of each end (over where the lateral posts sandwich a 15-inch-long plank). Then use a 3/8″ spring link—one that specifies a working load limit of at least a couple hundred pounds—at either end to hook the hammock to the hitch ring. 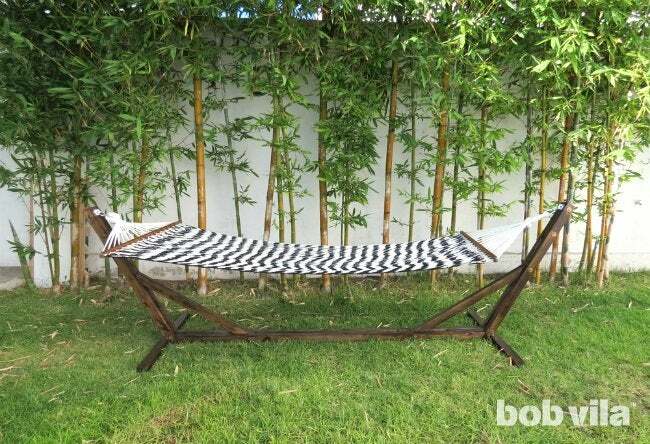 Last, but not least, climb on in and enjoy the view from your new DIY hammock stand.